Exotic Asian nibbles from chef Michael Schulson. : Chef Michael Schulson --- familiar to some from TLC’s competition series Ultimate Cake-Off --- is behind this modern Asian eatery located in bustling Midtown Village. Schulson turns out the same inventive cuisine that made a splash at his other restaurant, Izakaya at Borgata Hotel Casino & Spa in Atlantic City. Against a backdrop of distressed metals and rustic wood uplit by glowing wall art, Schulson mines gastronomies from China to Thailand and Korea. 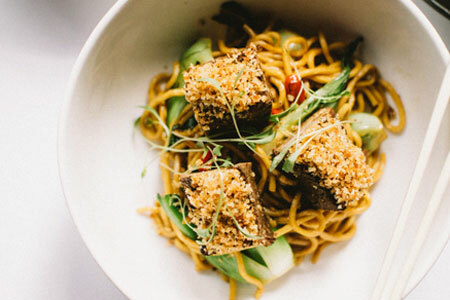 His signature silky edamame dumplings are a must, but also try braised short rib lo mein with apples and bok choy and investigate the diverse menu of satay that skewers everything from Kobe beef to king crab. Desserts change daily, including a different soft serve ice cream that depends on chef Schulson's mood. Saké leads the beverage charge, with varieties of both Junmai and Ginjo available in half and whole carafes. A handful of wines by the glass that pair well with bold Asian flavors; cocktails incorporating ingredients like saké, basil, lemon grass and lychee; and Asian brews imported from Japan, China and Thailand round out the libations. A daily happy hour is a bargain, with half-price buns, dumplings, grilled skewers and spring rolls along with special drinks.